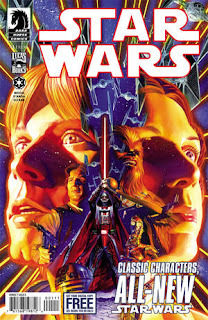 The Fellowship was fortunate enough to obtain a copy of STAR WARS #1 from Dark Horse Comics. Brian Wood writes, and Carlos D’Anda draws. It’s not long after the Battle of Yavin. The Rebel Alliance is having some difficulty finding a world to establish a new base on, and Mon Mothma thinks she’s figured out why. So she assigns Leia the task of finding the evidence they need, with Luke in tow. Meanwhile, Han and Chewie are off following their own orders. Or are they…? It’s the kind of move that can result in either the rise or the fall of the franchise. I think this book falls on the “rise” side of that equation, though. The main characters all feel like what we remember, on both sides of the fight. We get some excitement right up front and some dramatic tension to build the arc. And really nice art to make it all swing together. I think this one is a winner. They went with a hot hand in Brian Wood for this title, and I like where he’s taking this. There’s enough of the feel of the trilogy and some splashes of the feel of the novels (especially Zahn). It feels like the start of something good. STAR WARS #1 is available now at your FLCS or by order from darkhorse.com.